The delegations paid a visit to Wuhan Citizens Home on September 8, 2016. 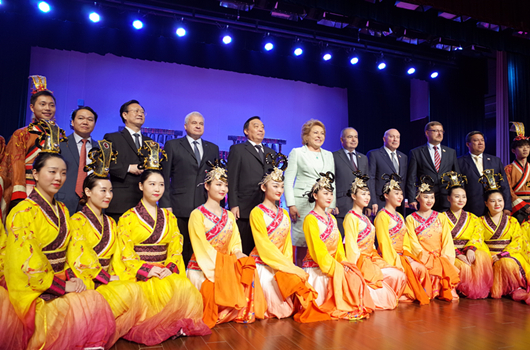 The delegated posed for photos with actors of chime bell performance in Hubei Provincial Museum. 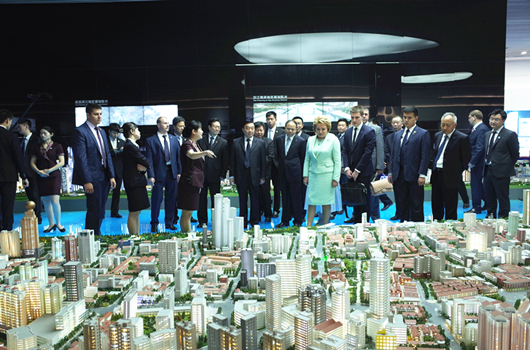 A Russian delegation headed by Valentina Ivanovna Matviyenko, Chairman of the Russian Federation Council, paid a visit to Wuhan, capital of central China’s Hubei province, on September 8, 2016. The delegation learned about Wuhan’s history and development in Wuhan Citizens Home, attended a wreath-laying ceremony to honor the sacrifices and service of the Soviet Volunteer Air Force at Jiefang Park, traced earlier cooperation between Hubei and Russia on the Yangtze River Bridge, viewed exhibitions of China-Russia Ancient Tea Route and Hubei intangible cultural heritages at Hankou Orthodox Church, enjoyed chime bell performances in Hubei Provincial Museum and visited Yangtze Optical Fiber and Cable Joint Stock Co., Ltd in East Lake High-tech Development Zone. Hubei province in central China has a profound history of bilateral exchange with Russia. As the start point of 13,000 km China-Russia Ancient Tea Route, Hankou tea once occupied around 70% of market shares in Russia, and today, tea from Hubei is still popular in Russia. Besides, recent years have witnessed increasingly frequent regional exchanges between both sides, as well as more cooperation in fields of economy, trade and culture, etc.